The numbers are extra­ordinary: one program, 11 national titles, six undefeated seasons; four years, four national championships; three seniors — Breanna “Stewie” Stewart, Morgan Tuck, and Moriah “Mo” Jefferson — with four championships apiece. Those same three seniors were selected one, two, and three in the WNBA draft — the first time any single school has done that. And there are other numbers that reflect just what this program is made of: Stewart’s four-in-a-row honors as NCAA Final Four Most Outstanding Player; the team’s current unbroken stretch of 75 wins (though that number hasn’t yet surpassed the Huskies’ previous winning streak of 90 games from 2008 through 2011). Dozens of former players were among the fans watching the game in Indianapolis, including UConn greats Sue Bird ’02 and Maya Moore ’11. In addition, Shea Ralph ’01 was on the sidelines as assistant coach; Rebecca Lobo ’95 was onsite as a commentator for ESPN; and Carla Berube ’97 was in the house coaching her own team, Tufts, in the DIII Final Four. A few weeks later, when the 2016 Olympics Team USA was announced, it included five former Huskies: Bird, Tina Charles ’10, Moore, Stewart, and Diana Taurasi ’05. 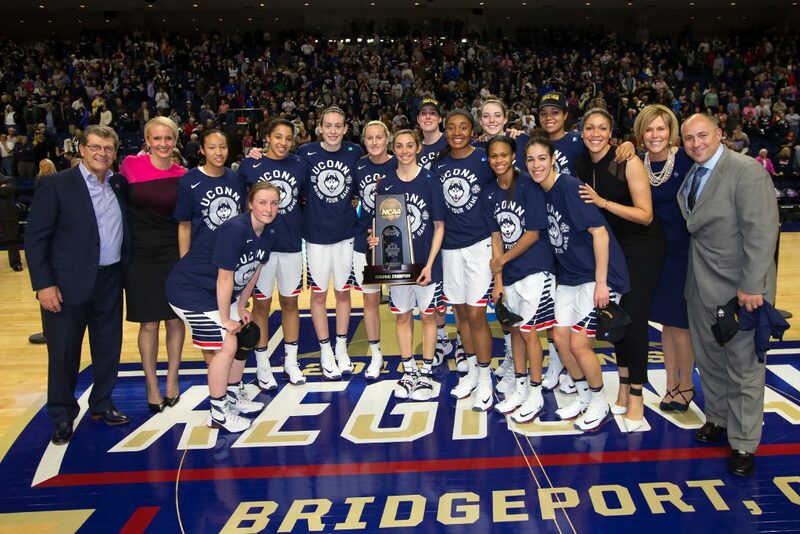 From a team that once played in the Field House with just a handful of friends and families to cheer them on, over the past 30 years head coach Geno Auriemma and associate head coach Chris Dailey have built the preeminent women’s college basketball program in the country. The records set this season are going to be hard for any team to beat — except perhaps the Huskies themselves. This season was the sixth undefeated season for Auriemma. The last time the women came up less than victorious was on Nov. 17, 2014, in an 88–86 overtime loss at Stanford. Among the records set this season: Coach Auriemma passed legendary UCLA men’s basketball coach John Wooden for the most NCAA basketball titles of all time — 11. He has never lost a championship game. The women’s NCAA basketball championship game against Syracuse was filled with high points and memory makers for Husky fans. 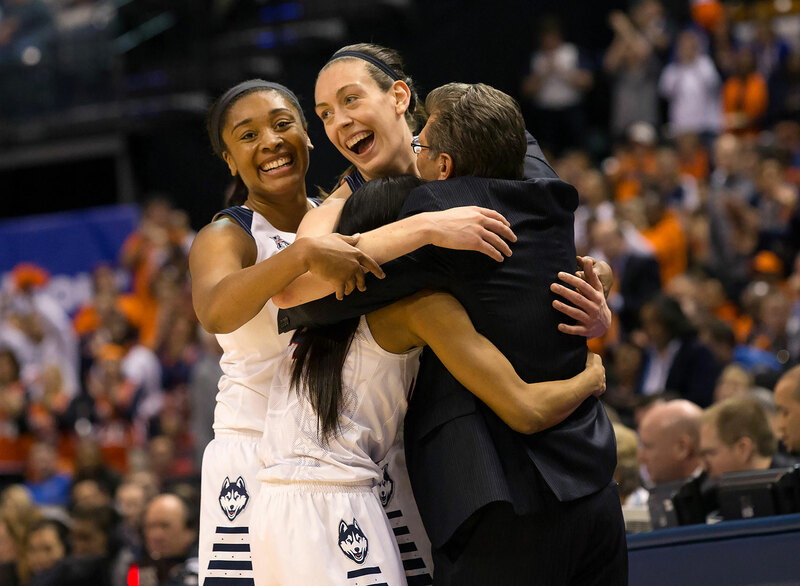 But for many, their favorite moment came with the three bigs — Breanna Stewart, Moriah Jefferson, and Morgan Tuck — on the bench. 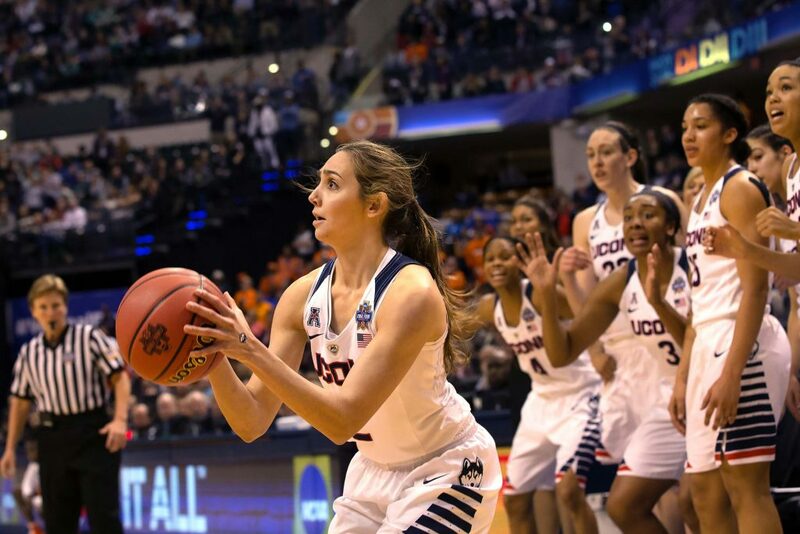 They had just come out of the game in UConn uniforms for the last time, there was just under two minutes left to play, the team had a comfortable 82–49 lead, and the already cacophonous crowd managed to get even louder as they cheered the subs off the bench. One of those subs was the fourth senior, Briana “Polly” Pulido, a pre-med student who had been a walk-on for the team since her sophomore year and became “our biggest hype man,” as Jefferson put it. Sophomore Napheesa Collier caught the inbound pass and tossed it to Pulido outside, just shy of three-point territory. And suddenly the crowd was quiet. As her teammates behind her silently willed her shot to go in, Pulido did what she always did in practice: drained it. “To see Polly make that shot? That was the perfect ending to the game,” said Stewart. For her part, Pulido called it the highlight of her year. And she says she wasn’t surprised at her teammates’ exuberant reaction. “I guess they’ve seen how hard I’ve worked these three years and the things I’ve done throughout and the transformation I’ve made. They’re happy for me and I’m going off as a senior and they know that, too,” said Pulido. While the others go off to the WNBA, Pulido will begin the grueling process of applying to medical school. “Somewhere warm,” says the Florida native, who admits she just can’t get used to New England weather. She also admits that playing on the best basketball team in the country while on the rigorous path to medical school has not been easy, but she says she never entertained thoughts of quitting. Her teammates and coaches react as former walk-on Briana “Polly” Pulido makes the championship game-ending shot. How did it feel to sink that final shot of the season with your teammates screaming behind you like that? It was amazing to get into a championship game. And then to make a shot in it — it was the highlight of my year! The team’s reaction when your shot went in looked even more enthusiastic than after you all won the game? What’s up with that? I guess they’ve seen how hard I’ve worked these three years, the things I’ve done throughout, and the transformation I’ve made. It was a moment for me and they were happy for me — and I’m going off as a senior and they know that, too. The crowd adores you — what’s it like to hear that roar when you get into the game? And what do you do to engender such love? I feel it, definitely. The fans, they’ve seen what the other girls can do and they want to see us get out and do it and get our time. We are going in nervous, ’cause we just have a couple minutes to do something, and we’re cold cause we’re right off the bench. Hearing the crowd, it takes the nerves away a little bit. Do you feel you have an important job to do when you are on the bench? Yes! I do. I think that the jobs on the team vary as far as importance or how big but I think every job is important, it’s important to have energy, to be there for my teammates, especially when things aren’t going well. And when they are going well, too — to have fun, to take part in the fun. Can you give us an example of what you do when things aren’t going well? Although that seems rare! And when things are going well? I guess that starts with my high-fiving every time we score a three. And jumping up and down, reacting to things. You tried out for the team after responding to a Breanna Stewart tweet asking for walk-ons. How did you notice that? It was my mother who brought it to my attention. She was like, ‘well look at this,’ and I said ‘yeah, look at that!’ She thought I should try it. She’s my biggest fan and she will support me through whatever. I have to give her credit; this never would have started without her. At the time you were on scholarship with Track and Field. I heard your track coach thought you were crazy. He did. And it did seem a little crazy to me, like maybe it was a little bit of a rash decision. But something in me was telling me to go for it, because this isn’t an opportunity that comes around very often. You did hurdles and that jumping ability seems to come in handy in basketball. I even heard that you once blocked a Breanna Stewart shot in a scrimmage. How did that feel — she’s got, what, 7 inches on you? Were you surprised to be offered a scholarship for your senior year? That happened after last season when we had our end-of-year meeting. The coaches pulled me in and I thought I was just a meeting with Coach, which is how it usually goes. When I saw that they were all in the room, I thought, ‘Oh no, what did I do wrong?’ Then they told me about the scholarship; I was very happy and grateful for that! What does being a student athlete mean to you? To a lot of athletes, student-athlete still means athlete first. In my case, it means student first. Especially this year, the teachers were a bit more unforgiving. I had to stay back [from travelling to away games] a couple times to attend my classes and labs. It’s been very tough. Basketball is a big time commitment, so some nights were very hard — I pulled a few all-nighters. It has been really tough catching up on everything I missed coming from the Final Four. I’ve been missing Monday and Friday classes during playoffs, so that’s making me miss some lectures I have to re-listen to. I had an exam and a lab report due yesterday and it fell on a bad day because then we had a team dinner. So yesterday was one of those days. But [the coaches] were very understanding this year. I went to Marissa first. She saw me flustered and she sat down with me. We got calendars out and we went through days I’d have labs, days I’d miss away games, days I could show up to practice later. Talking about some of those things with her, I felt calmed. Did you ever feel you wanted to just give up? No, not really, it was more like a feeling of defeat, being overwhelmed, wishing I had more time. But no, I never thought of quitting. Did I know that I could get better grades if I wasn’t doing this? Yes. But I never wanted to quit. While the other 3 seniors enter the WNBA, you will be applying to medical schools, right? Yes. 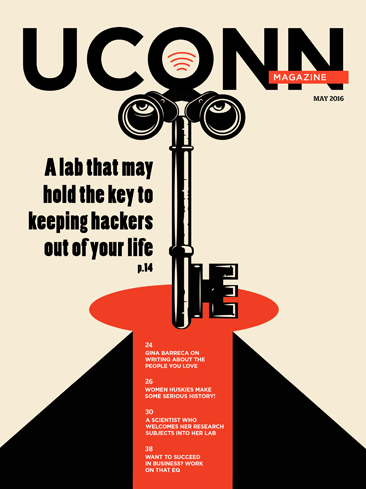 Applications open in June and I’ll begin to get acceptance notices in the fall. I applied to the summer MCAT pre-program and then it will be a long process in fall when I start to hear about interviews. It’s a year’s worth of work. What are your top choices for med schools? University of Florida, University of Miami, University of North Carolina at Chapel Hill, and UCLA. Warm — exactly! Coming from Florida, the New England weather has been a lot to deal with! That’s tough. It’s something I’m still battling with. I haven’t had the opportunity to explore it as much as you would normally. I did shadow a neurologist, which is what I’ve always thought I’d be. But recently I’ve been interested in Psychology. I could see myself being a therapist, counseling people. But that would mean going to grad school instead and med school is what I’ve always been working toward. Are there lessons you will take forward from playing on this basketball team? Advice from Coach Auriemma, for instance? I don’t know if it’s advice or just something he said that stuck with me: The reason why you don’t do something is you don’t know how or you don’t feel like it — those are the only two reasons for not doing something. So, once you know how to do something, if you’re not doing it, it’s because you don’t want to. So you ask yourself, ‘Why am I not doing this?’ I think that applies to so may things in life. How does the team let off steam, just have fun? We’ve gone to the movies, bowling — oh, and laser tag, we’ve played laser tag. Who’s the best at laser tag? I would say Lou [freshman Katie Lou Samuelson]. She was very, very good. I was so mad at her. Amazing season and amazing athletes. So lucky to see the team play in Bridgeport this year.